Although it’s called ‘The standard package’ it’s More than adequate in terms of aesthetics and audio capability for most clients and venues. The sound system on this package is typically suited for upto 200 people. There is the option to add extra speakers for larger crowd capacity or/and LED lit Truss podiums and with professional moving head lighting if the venue is extra large. 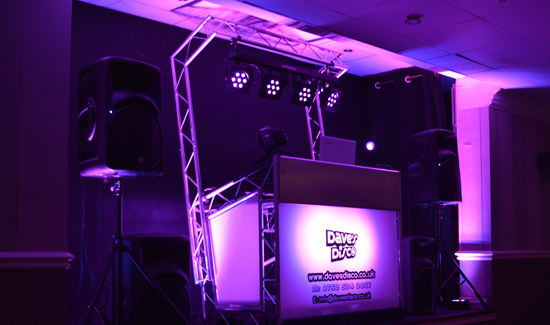 The standard setup comes with FREE sub bass speakers if the function room is accessible, for example, if the function room is on the ground floor or has a lift if it’s above ground level. The sub bass is not essential for this package, but it’s a great FREE audio add on if the venue is accessible. This package is the most popular and doesn't cost a great more! 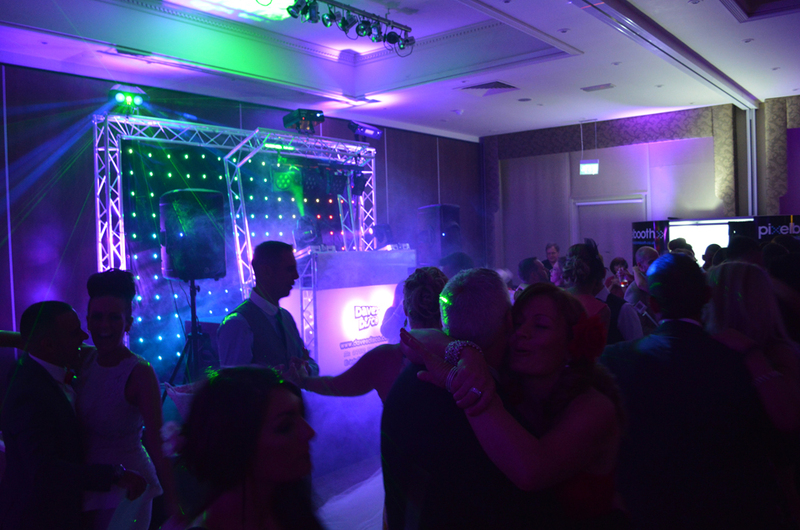 The addition of LED lit truss podiums with moving heads and DMX programmed lighting are especially impressive if your event is a wedding and ideal for the first dance. 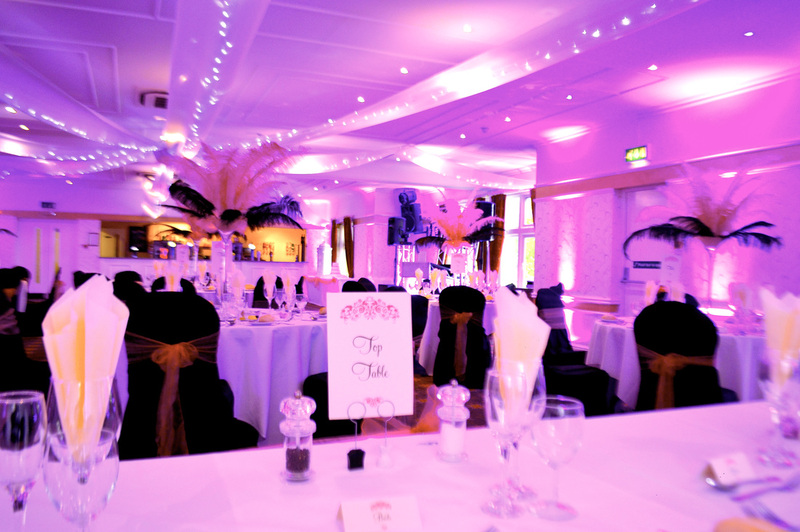 For example, typically, two moving heads are transformed into white spotlights and focused on the centre of the dance floor or the Bride and Groom, while another two moving heads create cascading purple patterns on the walls. At the same time, mood lighting within the podium can be programmed to smoothly run through ambient and vibrant colours, laser can be switched off and forward facing lights can be dimmed to create a visually impressive romantic atmosphere and photo friendly scene. 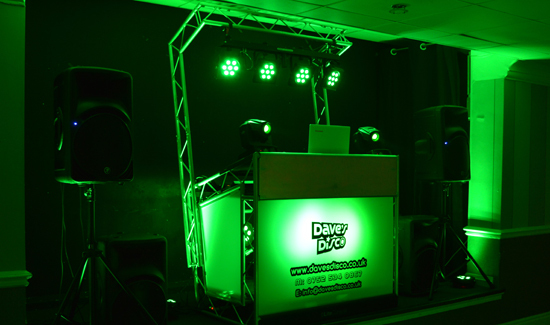 The speed of the lights can also be controlled to fit accordingly with the audio output (Podiums are price £100 a pair, or £180 for four, and can be demonstrated without any obligation. 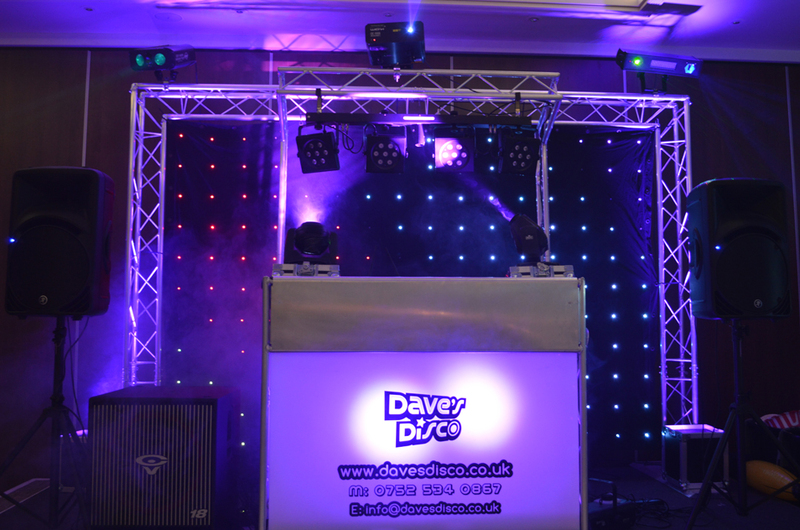 (I always enjoy meeting clients anyway) The Truss Podiums are also ideal for very large or wide venues where the typical DJ setup would look tiny in comparison to the room size; they really do add an extra prestigious wow factor to any event and fill empty spaces with colour. The sub bass speakers are not essential for this package, but it’s a great FREE audio add on if the venue is accessible. The ultimate setup is ideally suited for clients who want the extra wow factor, this package includes everything listed in the standard package, but includes 10ft wide x 7ft tall up lit Truss with matching LED curtain and extra lighting mounted on top of the truss. The sound system on this package is typically suited for up to 300 people. There is the option to add extra speakers for larger crowd capacity or/and LED lit Truss podiums and with professional moving head lighting if the venue is extra large. go the extra mile and transform any room into visually vibrant and atmospheric setting with mood lighting. Choose a colour of your choice, for example, set an intimate, relaxed, chilled, romantic or party mood according to the relevant colour. 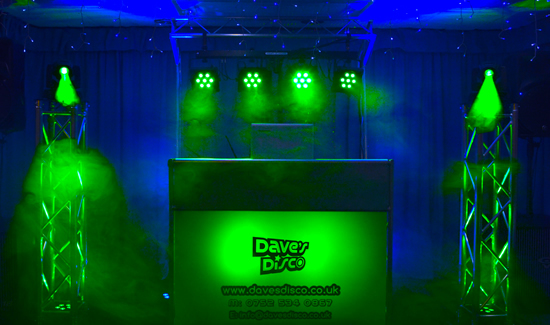 The lights can be set to a single solid colour or set to flash/strobe or smoothly change into various colours on a computer controlled DMX or by using the inbuilt sound to light setting. 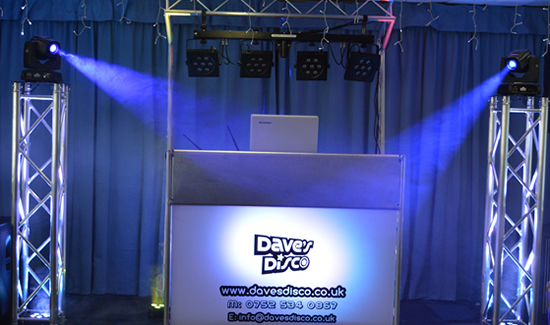 The DMX or sound to light settings are ideal for later in the evening when the party gets going. Up-lighters also help remove the harshness of standard lights in the ceiling and can be dimmed to suit any occasion. 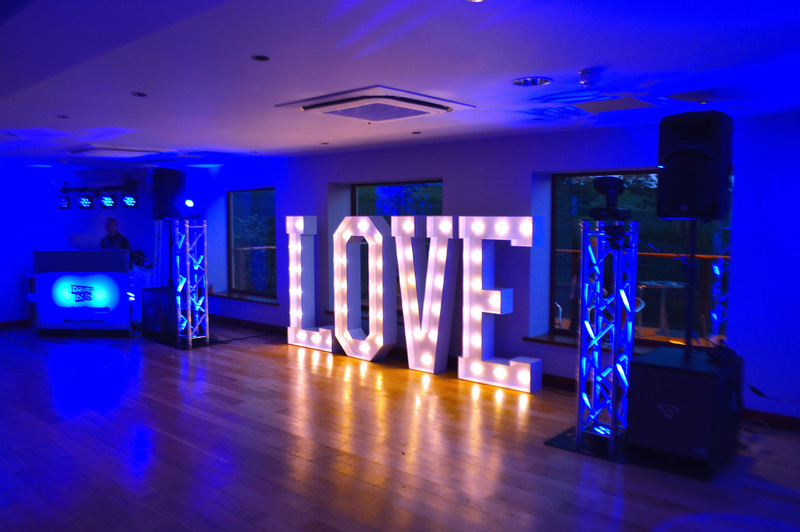 (Most people choose a single solid colour) We also offer large 5ft Love letters letters for weddings, ideal for creative photography or simply adding some extra pizzazz and elegance to your special day. 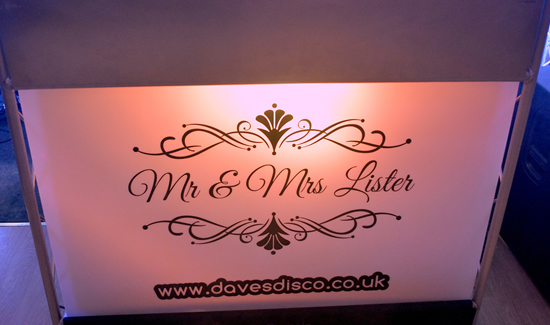 Our LOVE letters have dimmable lights which is ideal for setting the scene for those all important pictures, the dimming feature is also ideal if the letters are next to a star lit dance floor and the letters are overpowering the LED;s in the floor. For no extra cost, we are also happy to supply some up lighting behind the letters to add even more elegance to this wonderful effect. Discount is available when booked with disco and/or room moonlighting. Bride and Grooms often opt for making their brand new Mr and Mrs names a proud and prominent visual part of the celebrations. It’s often the small details that are the most memorable. Displaying the names of the brand new Mr and Mrs can be achieved in a number of traditional ways, for example, by using a projector or integrating it into one of our table plan designs. 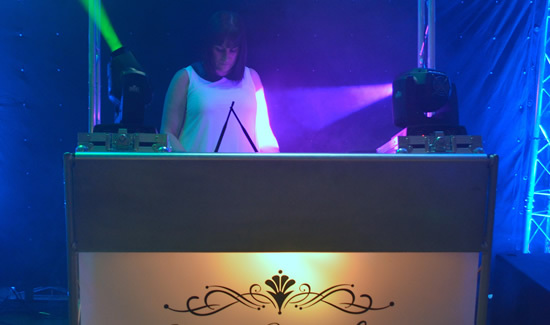 However, recently, one of the most popular request has been to display the names on the backlit DJ booth. 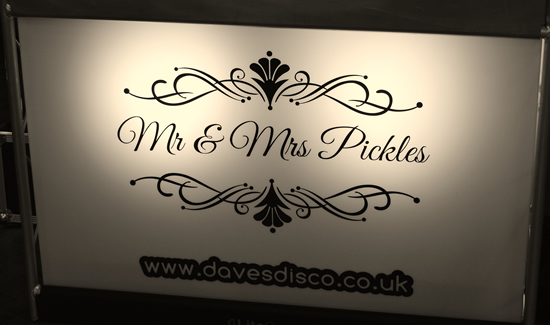 Perhaps one of the main reasons for this option being very popular is that fact that everyone looks towards the DJ’s setup when they first enter the room and having your names in lights on the DJ booth is an ideal visual centre piece for your big day/ This is a great alternative to using projectors ,it cost less and does not have the problem of obstructions blocking the light source.